Our group also studies supermassive black hole accretion (also known as Active Galactic Nuclei or AGN), including highly obscured AGN like the Compton-thick AGN in the galaxy Arp 299 (Ptak et al. 2015) and AGN in galaxy group environments. Identification of such systems and measurement of the conditions of the circumnuclear obscuring material and the intrinsic luminosity of the AGN are important for understanding the growth of supermassive black holes (SMBH), since it is generally believed that this growth often takes place in galaxy mergers and is heavily obscured. Different NuSTAR images of Arp 299, the red circles mark the Chandra positions. 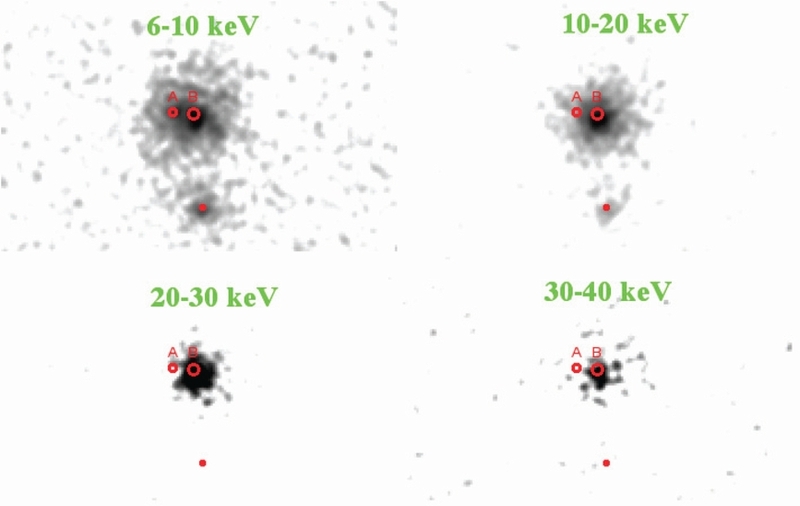 Note that A and B are the two galaxy nuclei involve in merger(Ptak et al. 2015).